Click to read Attorney At Law Magazine article. Doing a weekly TV show is time consuming. Plus, they are giving up a Saturday evening that is especially stressful during football season. However, both Wilkins and Porter feel like the show is accomplishing an important goal. Rocky Wilkins grew up in Jackson. He attended college and law school at the University of Mississippi. After a brief stint as a defense attorney in 2000, Wilkins started representing injured plaintiffs. “While I enjoyed my time working for insurance companies, in my heart I knew that I wanted to represent people instead of corporations,” he says. 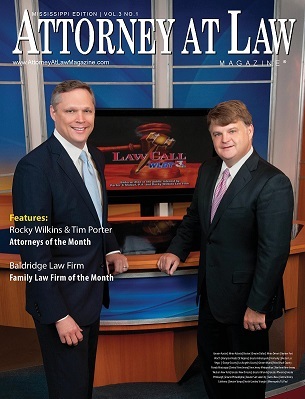 In 2003, Rocky Wilkins Law Firm, PLLC was opened with a focus on auto accidents and fire cases. The firm has achieved great success and Wilkins has tried over 30 jury trials in the last 10 years. Attorney Ben Wilson joined the firm last year due to the growing case load. Wilkins has obtained several large verdicts for his injured clients. “When you represent an injured person in a trial against a huge corporation, it is like a modern day David versus Goliath,” Wilkins said. The odds usually are against the innocent victim. “But I always liked the idea of settling disputes with a jury in court rather than with fists. To me, the jury is the great equalizer,” Wilkins adds. Wilkins is no stranger to the world of television law. Outside of his regular legal work, Wilkins has provided local radio and TV commentary on legal issues and had several appearances on CourtTV so it was a natural transition to “LawCall” for Wilkins. Wilkins is also getting a national reputation for handling death and injury cases related to cell phone tower construction and repair. “Over 100 people have died in the past 10 years and two men died in Copiah County this past May,” Wilkins explains. “‘Frontline’ just did a documentary called ‘Anatomy of a Cell Tower Death.’ This is now the most dangerous job in America and it is an epidemic.” Since the industry has failed to take action, Wilkins plans to use the legal system to make the job safer for cell tower workers. Porter first became interested in law during his time on the Brookhaven High School mock trial team. Porter placed well in the state competition and loved the process of debating issues against other students. Porter is a member of the firm of Porter & Malouf. He and his law partner, Patrick Malouf, met in law school. Both graduated in 1993. “We started our firm in August 1999 and have been blessed in our practice.” We have had the privilege of representing thousands of individuals,” says Porter. Tim Porter has carved out a niche against the manufacturers of dangerous products in cases involving asbestos, silica and victims of the BP Oil Spill. He also handles pharmaceutical cases, defective products, and general personal injury matters. He has used that expertise during the TV show. “We had a woman call in with mesothelioma,” Porter says. “She was dying and there was little we could do for her at that point in her life, but we were able to talk and give her advice that helped her children in dealing with the aftermath.” Without “LawCall,” she most likely would have never known her legal rights. Porter’s firm just began a new endeavor that is a first of its kind – representing women that use talcum powder, and develop ovarian cancer. Our firm is working with Allen Smith of the Smith Law Firm, pursuing cases against talcum powder manufacturers, for causing ovarian cancer in women that use the products. The two firms are the first in the country to file a case against talcum powder manufacturers for causing this type of cancer. Porter also loves going to trial, and his firm handles plenty of them. “Many of the cases get settled, but we still handle about 10 trials a year and cover both small and large cases,” he says. Rocky Wilkins’ father was legendary criminal defense attorney, Sam Wilkins. The younger Wilkins would tag along to work with his father. “My Dad used to take me around with him to the courthouse when I was young, so I guess you could say I have being a trial lawyer in my blood,” reflects Wilkins. CAN YOU MAKE A CITIZEN’S ARREST? Porter, too, is married to a lawyer, though his wife Samantha practices mainly in chancery court. “She really enjoys the challenges presented in chancery court and she does an excellent job,” he says. For most viewers, what they know about the law they learned on TV. “We had someone call in about how to conduct a citizen’s arrest,” Porter says. “While we advised them it wasn’t a good idea. I haven’t heard that term since Goober chased Barney on ‘The Andy Griffith Show,’” Porter adds with a laugh. From “Perry Mason” to “Matlock” or from “LA Law” to “LawCall,” a lawyer on TV never knows what he will face each week. Any time issues arise that require more attention than “LawCall” can provide, Porter and Wilkins are both ready to either refer the caller to their own firm or to someone else who can help. Sometimes the cases require an attorney letter, other times they require an actual suit to be filed. Either way, Wilkins and Porter make sure that people have easy access to helpful attorneys. “Probably not as much as Rocky would like,” Porter adds with a laugh. “LawCall” can be seen every Saturday at 6:30 p.m. on WLBT and is viewable throughout all of Central Mississippi.